Serve those wedding reception goodies on three levels with this tray made with terra cotta saucers and paint. Terra cotta saucers: 7", 8", and 10"
Paint sides of candlesticks Sterling Silver and let dry. Paint rim and sides of saucers Cloud White and let dry. Use Sterling Silver to paint outside of saucers below rim; let dry. For heart designs, place stencil flat on surface and use pouncer brush dipped in Sterling Silver to stamp lightly over stencil. Place stencils randomly, alternating positions of hearts. After each stamping, be sure there is no paint on back side before reusing; refresh stencils as needed. Let dry. 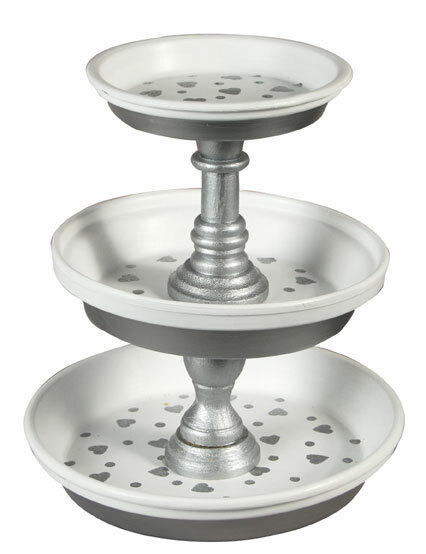 For dots around hearts, dip pouncer into Sterling Silver and stamp dots inside saucers to fill spaces around hearts. Let dry. Use ruler to measure and mark center bottom of small and medium saucer with pencil. Use E6000 to glue top of a candlestick to center bottom of small and medium saucer, gluing as close as possible to exact center. Let dry. Referring to photo for placement, glue bottom of candlestick on medium saucer to center of large saucer. Glue bottom of candlestick on small saucer to center of medium saucer. Let dry. Make sure saucers chosen sit level. Remove all labels and wipe surfaces with paper towel before painting. If metal inserts on candlesticks are not even with surface, screwdriver and pliers can be used to remove inserts so candlesticks will rest evenly on saucer surface when glued. I would think you would not have to use this idea just for weddings... what about an all purpose one or any other holiday!!! love this idea will diff have to do!! !